As a new generation of main battle tanks came on line during the 1980s, neither the US nor USSR had the chance to pit them in combat. But once the Cold War between the superpowers waned, Iraq’s Saddam Hussein provided that chance with his invasion of Kuwait. Finally the new US M1A1 tank would see how it fared against the vaunted Soviet-built T-72. On the morning of August 2, 1990, Iraqi armored divisions invaded the tiny emirate of Kuwait. The Iraqi Army, after its long war with Iran, had more combat experience than the U.S. Army. Who knew if America’s untested forces could be shipped across the world and thence contest the battle-hardened Iraqis on their home ground? The Kuwaitis had collapsed easily enough, but the invasion drew fierce condemnation from the UN, which demanded Saddam’s withdrawal. Undeterred by the rhetoric, the Iraqi dictator massed his forces along the Saudi Arabian border and dared the world to stop him. In response, the U.S. led the world community in a coalition of 34 nations in what became known as Operation Desert Storm – a violent air and ground campaign to eject the Iraqis from Kuwait. Leading this charge into Iraq were the men of Eagle Troop in the US Army’s 2d Armored Cavalry Regiment. 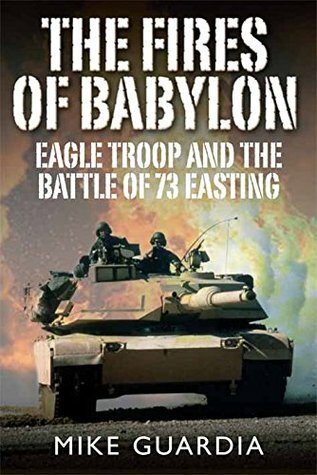 Commanded by then-Captain HR McMaster, Eagle Troop was the lead element of the US VII Corps’ advance into Iraq. On February 26, 1991, Eagle Troop encountered the Tawakalna Brigade of Iraq’s elite Republican Guard. By any calculation, the 12 American tanks didn’t stand a chance. Yet within a mere 23 minutes, the M1A1 tanks of Eagle Troop destroyed more than 50 enemy vehicles and plowed a hole through the Iraqi front. History would call it the Battle of 73 Easting. This is a story about the first Iraqi war and how 12 American tanks Eagle Troop lead by Captain HR McMaster, took out or I should say destroyed 50 Russian made tanks in 23 minutes. The book begins though with the begging’s of the cold war and the lack of equipment after the Vietnam war. Then goes into how advancement came into tank warfare and what it was like on the line in Germany during the cold war. He also explains the training that goes into being assigned to an Armored Division and how even in that unit you’re shooting had to excellent and it was most if not all gunners had scores or high 90% or 100% on range firing from a tank that is amazing and that includes moving targets. I have seen some of these exercises for I grew up I Barstow and would go to FT. Irwin training center when I was younger this of course was with the older tanks but still was impressive then and would be more now. Each chapter goes into a story about one of the men in the unit how and why they joined and how they got selected to be part of that unit. When you get to the end of the book the author goes into what happened to each man that had fought. A very good book. I got this book from netgalley. I give this 5 stars.